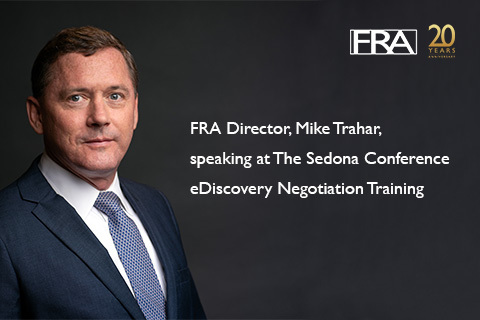 FRA Director, Mike Trahar, will join the The Sedona Conference Institute 2019 eDiscovery Negotiation Training: Practical Cooperative Strategies taking place in Washington, DC February 6 – 7. The Sedona Conference Institute is presenting the eDiscovery negotiation training, with the goal of fostering cooperation among parties during discovery, particularly with respect to Electronically Stored Information (ESI). The event will gather leading in-house counsel, outside counsel, and eDiscovery experts with the aim of helping participants develop practical skills in eDiscovery negotiation. Mike is on the faculty with Sedona, and will help lead mock trial preparations of two teams, one each for plaintiff and defendant as part of a two-day training on eDiscovery negotiation. Key insights will be featured on the FRA website following the event.